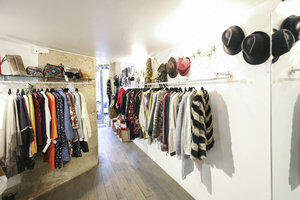 This cozy 28 sq m boutique between Rue de Turenne and Rue de Bretagne is perfect for ready-to-wear retail, pop-up stores and accessories showrooms. The interiors have a historic feel with exposed stone walls, wooden floors and antique features throughout. The white walls and modern spotlight bring a contemporary edge to the space. 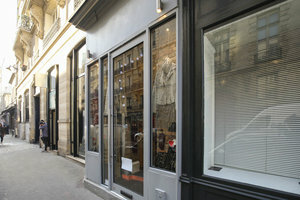 With a window display and inviting frontage, the store offers good exposure on a very busy street. 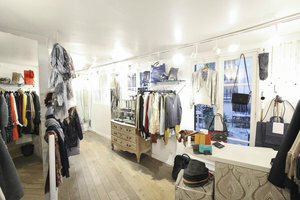 This space is well suited to ready-to-wear retail with garment racks and a stock room among other facilities. Neighbored by top designer outlets including A.P.C, Études Studio and Zidag & Voltaire, and surrounded by popular art galleries and restaurants, this shop benefits from a high level of foot traffic from shoppers and tourists and is perfect for creative brands to host their unique pop-up experience.